Bon Voyage, Voyager: Old Friends Take Stock Long gone, but never forgotten, Voyager 1 is about 12 billion miles from home and now sailing through interstellar space, scientists were thrilled to confirm in 2013. The spacecraft carries with it a generation's dreams. For the scientists who have emotionally traveled with NASA's Voyager mission for decades, 2013 will be remembered as the year they knew Voyager 1 had finally become the first explorer from Earth to enter the mysterious realm of interstellar space. Voyager 1 and its twin, Voyager 2, both blasted off in 1977, more than 35 years ago. Voyager 1 flew by Jupiter, then Saturn — and then on toward the unknown region that lies between stars. Tom Krimigis, 75, works at Johns Hopkins University's Applied Physics Lab. He was the youngest principal investigator for Voyager when it started. "We knew that we had a long-lived spacecraft in our hands," he says. For Krimigis, the question became whether he would live long enough to see Voyager break through the boundary. The telltale signs they'd been waiting for came last year, when Voyager's data showed that something unusual had happened on or about Aug. 25, 2012. "We were absolutely certain that a big boundary was crossed," Krimigis says. They saw a sharp decrease in lower-energy particles that come from inside our solar system — and a big increase in the higher-energy particles that come from outside our solar system. Did this mean Voyager had crossed into interstellar space? "Most of us felt, I would say, 90 percent sure," says Krimigis. But they weren't about to make an unprecedented, once-in-history announcement without being totally sure. This spring, they were able to get the proof they needed, when Voyager registered the effects of a solar eruption that had happened months before. 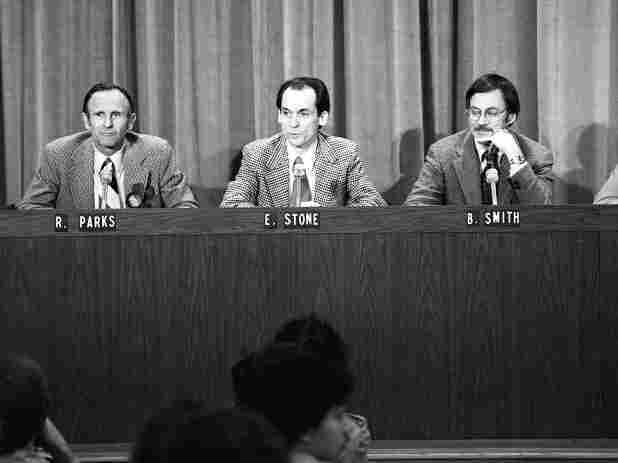 Ed Stone, a professor at Caltech and chief scientist for the mission, was 36 years old back in 1972, when he and his team were designing the mission. 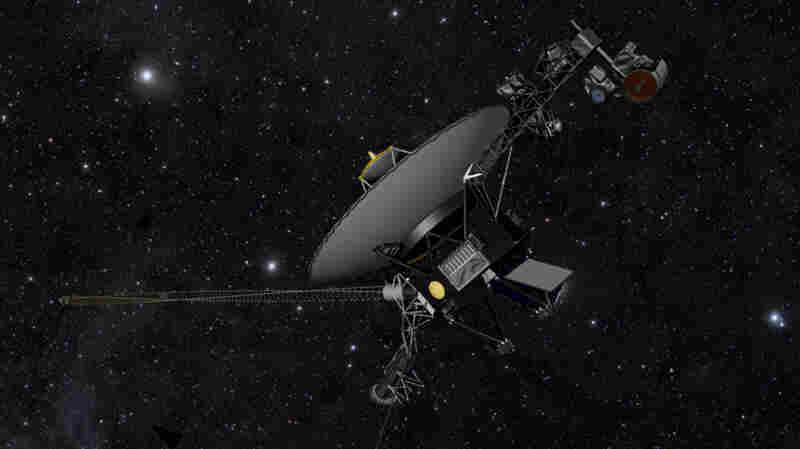 Even though the original goal was to visit the outer planets, he says, his team had always hoped that Voyager would still be working when it finally left the bubble of charged particles created by our sun. Caltech's Ed Stone and other members of the Voyager mission discuss the spacecraft's closest approach to Jupiter in March 1979. Stone compares this achievement to other exploration milestones, like circumnavigating the globe. "I don't know how many ships started out, but I think only one made it," he says. "This has the same kind of element of risk. It was an obvious thing to try to do, but it was not obvious that it could be done." For the first time, he says, we really have left home — even though the scenery may look like just more dark space. "The spacecraft itself is unaware that any of this is happening," says Stone, "and if you were an astronaut, you'd be unaware of it as well." But he and other longtime Voyager scientists are very aware that Voyager has traveled to someplace new and unexplored. "It's quite a romantic idea, of course," says Norman Ness, a physicist with the University of Delaware. He's now 80 years old, but he still remembers how happy he was on that day back in the 1960s when he got a telegram saying he'd been picked for the Voyager program. "When I was a kid, growing up, science fiction was a great fascination for me," says Ness. But he never thought interstellar exploration would be a part of his future. Voyager is now around 12 billion miles away from Earth. Its transmissions take more than 17 hours to reach our planet. Voyager veteran Don Gurnett, of the University of Iowa, says the distance the spacecraft has traveled over his lifetime is mind-boggling. "But, on the other hand," he says, "compared to the vast distances between stars and in the universe, it's just puny." The scientists should get another shot at seeing this strange boundary region when Voyager 2 gets there. And they'll keep listening to Voyager 1, until its power runs out in about a decade. After that, the spacecraft will keep moving outward, finally getting close to another star in about 40,000 years.